Back on January 26th I wrote a post “The Dakno Studio Comes to Life“. Little did Brad and I know what started as an idea to build a studio and share streaming webinars would explode so quickly. Our initial intention was to live stream webcast of FREE real estate marketing seminars and our Blogging BootCamp sessions. Later we decided to create videos to support our Dakno clients who wanted help with their SwfitBlog powered by WordPress. Knowing all of these client support videos needed a “home” of their own, we decided to build a portal to house a “mashup” of support videos, and FREE marketing videos and make them available to everyone! Another “Fix” for the Domain Junkies! Being the domain junkies that we are, Brad bought yet one more domain name (how many is that?). With new domain name in hand, we set about to develop a portal to house all of our archived live streams so our clients and our friends in RE.net could benefit. Thus the creation of dakno.tv! What’s to See on dakno.tv? In less than 3 months the Dakno marketing team has produced and archived over 20 recorded sessions and they are available right now for you see and hear at dakno.tv! In addition to the Virginia REBar Camp recorded sessions, Dakno.tv also features FREE WordPress training videos, and our archived FREE real estate marketing webcasts. The feedback to the archived marketing videos and the WordPress training videos has already been very positive. 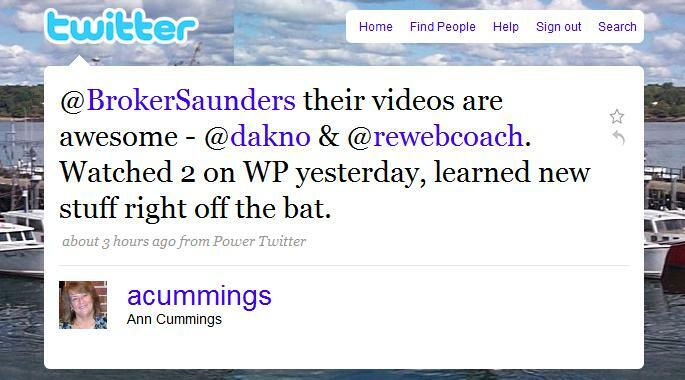 Check out what renown real estate blogger and Portsmouth real estate agent Ann Cummings had to say after watching two WordPress videos on dakno.tv. Going forward, our goal is to webcast at least one FREE real estate marketing stream each month and archive each webcast at dakno.tv. By the way, the next FREE live real estate streaming webcast will be this Tuesday, March 17th at 2PM so don’t miss it! Plus, coming soon, all Dakno cleints (and perspective clients) on the Dakno Agent Backdoor System will have the opportunity to review “how to” videos on the best practices of using their ABD site editor and leads management system, so stay tuned for those videos. One last adventure that is sure to create the buzz in RE.net is the upcoming ReTech South Conference. Brad (@dakno) will be speaking and I (@rewebcoach) will be manning the camera as we live stream from this event. Tweets will fly for sure when we go live from RETech South in Hotlanta next week so stay tuned. dakno.tv is Your FREE Resource – What Content do You Want to See? We invite you to click over to the FREE real estate marketing resource that is dakno.tv. Once you visit the site we encourage you to leave a comment here and tell us what kind of videos would you like to see in the future at dakno.tv. See you soon in dakno.tvland! Congrats on the launch! This is such a great resource. I will be sure to spread the word and get other folks watching as well. I found this great video on Twitter too! Free real estate advice and information using video is very useful. Danko.tv is amazing! It provides free real estate marketing webcast.